This species is one of the largest nudibranchs on the Pacific Coast of North American. Specimens may reach 200 mm in length. Their color varies tremendously from white through grey, orange and red. Regardless of body color, the species can always be distinguished by the white line along the edge of the foot. What makes this species special to me are its various behaviors. First Dendronotus iris is a great swimmer . It is capable of propelling itself out of harm's way by flexing its body from side to side. 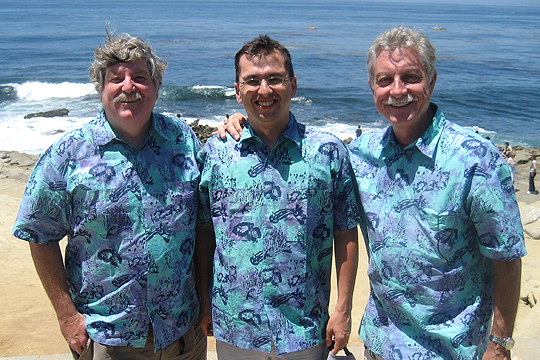 This species feeds on burrowing sea anemones, Pachycerianthus fimbriatus. When the slug locates the anemone, it rears up and back , the way I envision Tyrannosaurus rex did when attacking potential prey, opens its mouth, and crashes down on the unsuspecting anemone. 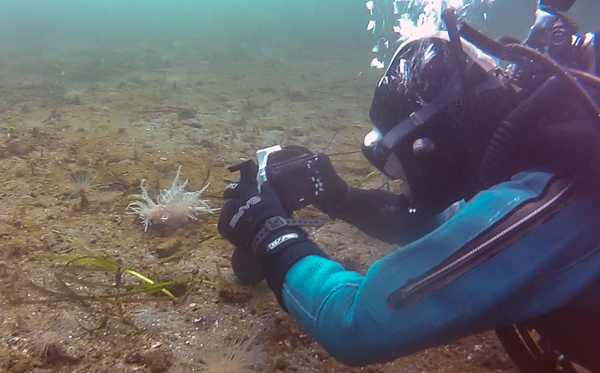 This results in a tug of war between slug and cnidarian, the slug often being dragged right down the anemone's tube. Secreting digestive juices, the slug eventually over powers the pull of the anemone and wins the battle. 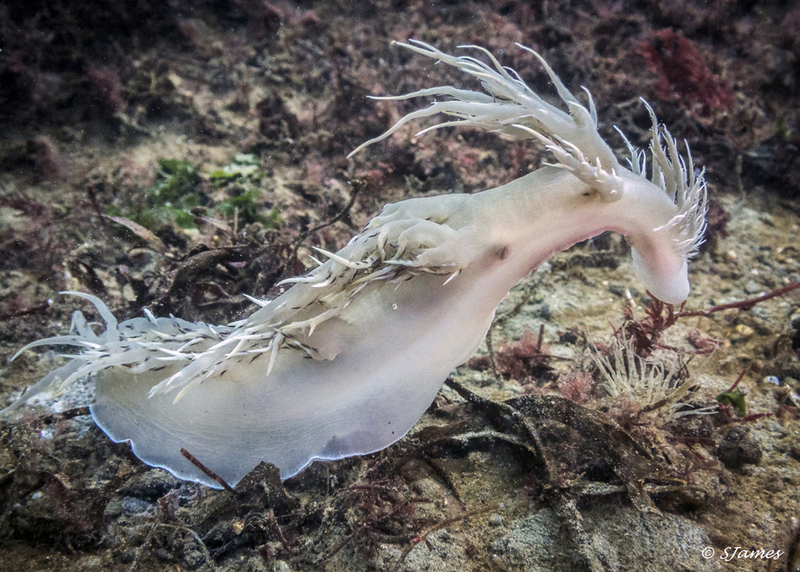 How dramatic is that - maybe the craziest in the nudibranch world. WEBMASTER'S NOTES: Folks, there is a new kid on the block bookwise. This one you can't do without if your are a frequent traveler to the Anilao area of the Philippines. The price is definitely right at $15! The I-book is a guide to the nudibranchs and other sea slugs seen during the 1st Nudibranch Festival, 2016 in Anilao in the Batangas region of Luzon Island in the Philippines. Over 490 species are described and illustrated many with multiple images and with general information of the the families and groups. This is the first guide to these beautiful molluscs in this area. For ordering information, please go to Anilao Nudibranch E-Book! I am a recent graduate from Vancouver Island University (VIU), with a Bachelor of Science. I majored in biology, with a specialization in marine and terrestrial ecology, and minored in visual arts. I have always had a love of nature and art, and a desire to explore under water. I started diving in June 2014; the majority of our diving has been shore dives out of Nanaimo and Nanoose Bay, British Columbia, Canada. I have now logged almost 80 dives. I just started taking underwater photos this year, making the switch over from GoPro video; these photos were taken on my 3rd and 4th dive with my new camera. I am using a Nikon 1 J1 in the Nikon dive housing with the 1 Nikkor VR 10-30mm lens. I currently do not have a strobe for my set up yet so all my photos thus far have largely utilized natural light, some have required the use of a dive light. I am looking forward to getting a strobe in the future though! My dive buddy Colin O'Shea has posted vidoes of Dentronotus iris hunting and swimming on YouTube!